Whoo! Have you looked at the cost of baby gear and gifts lately? They’re crazy expensive! It’s been a while since I’ve had to buy a baby gift but I don’t recall them being quite as expensive as they can be now. Luckily, I’m cheap and that helps you! These 10 budget gifts for expectant mothers are perfect for Christmas, her baby shower or as a “Yay! The baby is here!” gift! Most of them are well under $20.00 so they should fit right into your gift giving budget! If your gift giving budget is slim this year, be sure to check out these 15 Tried & True Ways to Earn Money from Home. They can all help you boost your budget enough that it will make gift giving easier. Also, be sure to check out how to get $1,091 in FREE baby samples too! You could use them for a gift basket or other goodie for the expectant mom on your list! The thing about buying baby gifts is to understand the myth of baby gifts. We’re often taught that baby gifts have to be super expensive and flash, but the truth is that most of the flash and expensive baby gifts tend to go unused only to be sold to another unsuspecting mother or gift giver. Now don’t misunderstand. I’m not by any means saying to give a cheap gift. Cheap and budget friendly are two totally different things. Cheap means cheap in price and cheaply made. Cheap gifts tend to break easily and are a waste of money. Budget friendly gifts aren’t made cheaply, but they happen to be cheap in price. Some of the most used and welcome gifts that a new mom receives are the ones that actually functional and are actually helpful to the new parents. The higher priced gifts will be appreciated, but they won’t be appreciated anymore than that budget friendly gift that they use everyday. These 10 budget gifts for expectant moms are all great, useful ideas but most of all? They’re budget friendly! Homemade Gift Basket – We all know that gift baskets full of the items is awesome, but they can be even more awesome when you take the time to fill it with items that will actually be needed. Head to Dollar Tree and grab a pretty basket and a roll of ribbon in pink or blue. Then, fill it with things like our Homemade Diaper Rash cream, cloth or disposable diapers (whichever Momma will be using), bottles (or breast milk storage bags), baby wipes, and other items that you think the new mom will need. Carseat Cover – This one is important if your new mom lives in a state that gets a lot of cold weather in the winter and is one that you can get technically free over HERE. The total cost of the “freebie” carseat cover will run you around $14.00 for shipping (give or take) and your new Mom will appreciate a way to protect baby from the weather. Build Mom a diaper cake – Have you ever seen the cute little diaper cakes that show up at some baby showers? They’re actually really easy to make and the expectant mom on your list will love it! If you need inspiration, Baby Savers has an awesome round up with several different easy to make diaper cake tutorials. Nursing pillow – The same company that does the free carseat cover also offers a free nursing pillow. Again, you can pick it up for under $15 for shipping and even bottle feeding moms will appreciate a way to support their arms when feeding baby. You can get the pillow HERE. Hospital Survival Kit – Help the expectant mom on your list make sure she has everything she will need for the hospital with a hospital survival kit. In it, include things like toothpaste and mouthwash, deodorant, a hair brush, light socks, Chapstick, snacks and a few pieces of small entertainment (paperback, deck of cards, etc). Store it all in a plastic tote with a lid (so that it is easy to transport) and decorate it pretty and you’ve got a wonderful gift! Your time – As someone who went through her pregnancy with little support until the very end, I can tell you that there isn’t much more that an expectant mom wants except for support and maybe a few hours of your time. Schedule a pampering date with her, help her put up the crib (because have you EVER put one up yourself? It’s cruel I tell you! Cruel!) and so on. She will appreciate it and you’ll get to bond with baby before he or she arrives. Play Yard – These days, a play yard can come with everything from a portable bassinet style sleeper to a removable changing table. You can easily choose from several different designs that are all pretty affordable. Walmart.com seems to be the best place to get them for a lower regular price unless you can find a specific deal. Good pair of slippers and a comfy robe – Having a baby is hard work and the first thing Mom might want to do (aside from hold her little one) is to try and relax. Gifting her a good pair of slippers and a comfy robe to relax in after she gives birth might just be the ticket to a great gift for her. Mom Survival Kit – For a new mom, things get very hectic, very quickly. Putting together a new mom survival kit can be especially helpful. In it you can include things like pain medicines, calming and energizing essential oils, snacks, water bottle, lip balm and any other items that a new mom might need. Package it all up in a pretty jar or box, add a pretty bow and gift away. For a super personal touch, make her some homemade coconut shampoo, a jar of Mint Chocolate Chip Body Butter and a batch of Oatmeal & Lavender bath bombs and include them too. She will love that you took the time to not only put everything together for her, but also to personalize it with a homemade item or two. A Month of Freezer Meals – As a new mom, the last thing I wanted to do was cook and as an expectant mom in my last couple of months? Well I could barely walk well enough to cook, lol. Cooking up a few freezer meals for your new momma might just be one of the best things you can gift her. Use foil baking pans with lids and be sure to write the heating directions on top. She will thank you when her belly is full with very little effort. Most of the recipes we have HERE are freezer friendly so they would be perfect additions to your freezer cooking baby gift! 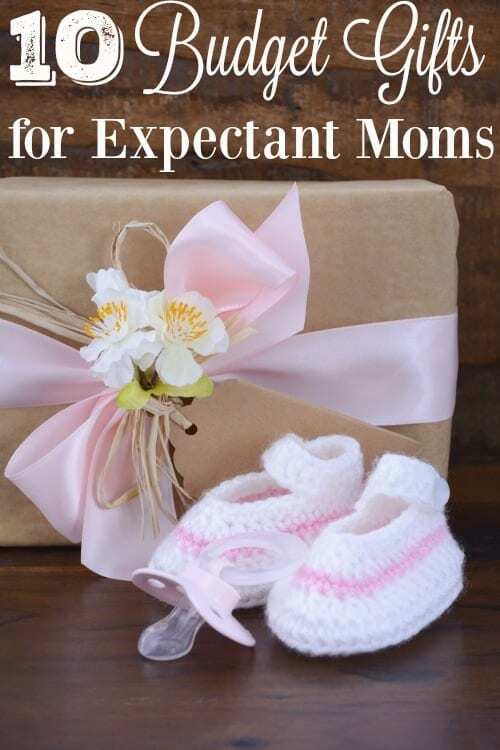 Giving a thoughtful gift doesn’t have to be hard, especially when you’re gifting an expectant mom. Instead of stressing and spending a ton of money, simply think about what she would need most. Go with that idea and you’ll be making a new momma very, very happy!